A firm fans’ favourite at Old Trafford, the Spanish goalkeeper remains strongly linked with a return to his homeland. 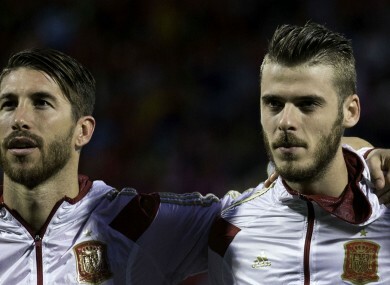 David de Gea and Sergio Ramos have been linked with a move away from their respective clubs. GARY NEVILLE HAS warned former club Manchester United to think twice before offering goalkeeper David de Gea plus a big-money bid to lure Sergio Ramos away from Real Madrid. The 29-year-old defender is being linked with a move to Old Trafford, although the decorated Spain international has seemingly played down the speculation. De Gea was last month crowned the club’s player of the year in recognition for a stunning season that saw United reclaim a place in the UEFA Champions League. A firm fans’ favourite at Old Trafford, De Gea remains strongly linked with a return to his homeland after four years with the Premier League club, but Neville hopes United do not undervalue the young Spaniard. Email “Gary Neville scoffs at rumours of De Gea-Ramos swap deal”. Feedback on “Gary Neville scoffs at rumours of De Gea-Ramos swap deal”.